This painting by Henry Worrall, completed in 1878, challenges the assumption that Kansas was part of the "Great American Desert." Although there had, indeed, been a severe drought during 1860, Worrall believed that Kansas did not deserve this harsh reputation. In the foreground, his painting depicts the bountiful harvests of grain, watermelon, and potatoes, while the background includes rain showers and a rainbow stretching across the horizon. 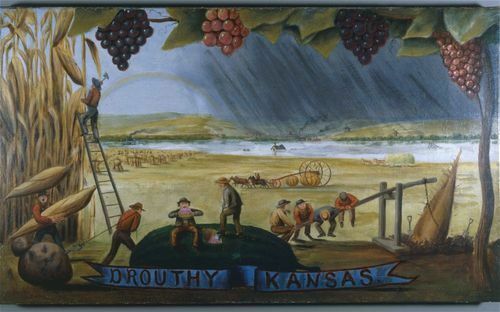 Although Worrall was a very productive artist, "Drouthy Kansas" quickly became his most famous work.